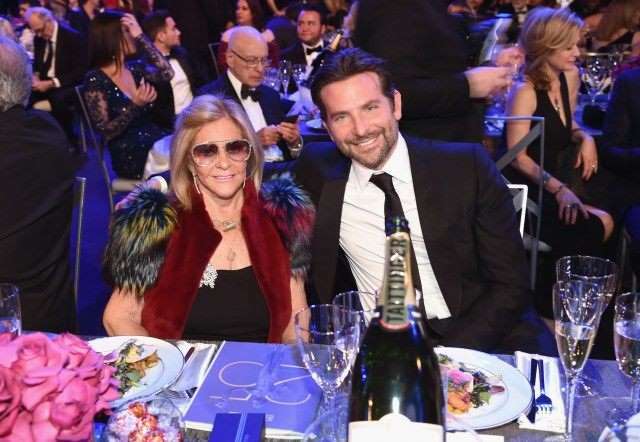 Actor Bradley Cooper enjoys the 2019 SAG Awards with his mom he brought as his date. American actor Bradley Cooper knows how to make her mother feel special and precious. Even though Cooper's longtime girlfriend Irina Shayk was away for a work event in Russia, it didn't stop the brilliant actor to bring another valuable woman in his life on the Sunday ceremony. As we mentioned, the 2019 SAG Awards couldn't be more spectacular when it witnessed Oscars nominee actor Bradley deciding to bring his mother Gloria Campano as his date for the night ceremony. Aww. As a matter of fact, both Cooper and his mother Gloria Campano stole the event's attention when the two arrived at the show holding hands. The A Star Is Born actor and director looked formally handsome as ever donned in a classic black suit designed by Gucci, followed by white dress shirt and a black tie. The star's mother looked no less stunning either. Mrs. Campano looked all dolled up in a black dress and a furry colorful jacket. She further accessorized her attire by putting on a sassy and shiny bordered shade. Like mother like son, perhaps. Their presence at the SAG Awards looked even more phenomenal since Cooper was nominated for two categories; Outstanding Performance by a Cast in a Motion Picture and Outstanding Performance by a Male Actor in a Leading Role. Although the 44 years old actor didn't win any Awards, he along with his film co-star Lady Gaga went on stage to present their film and a few snap pictures between the breaks. Furthermore, there's a high chance that Cooper might attend the 2019 Grammy Awards which will kick off on Feb next month since his debut directorial film song; 'Shallow' received its nomination in the category of Record of the Year and Song of the Year.